Since this issue comes out today, I took special care to not spoil the plot or reveal the ending. But, please be aware, I do provide an image of one of the featured characters. If you are concerned with spoilers, I’d recommend reading this after you have enjoyed the book. 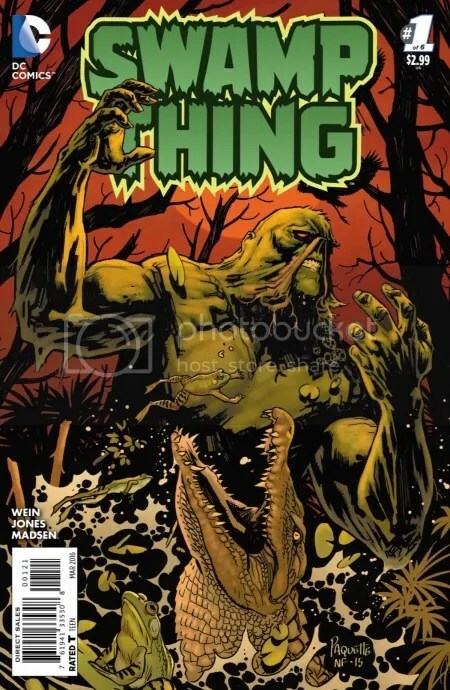 The new Swamp Thing book is out and I’ve been eating it up. I’ve read it 6 times now and love the new/return of the old direction. I’m enjoying the characteristic changes and find them quite refreshing. 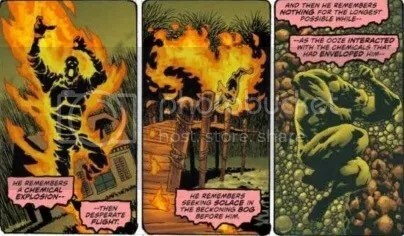 Swamp Thing’s smart Alec tone makes him seem more comfortable and less vulnerable in who or what he is. He is playful in talking to himself as well as during his interaction with others. From this initial issue, he seems like a character who has been around for a little while, has had a few encounters and it’s not his first rodeo. I certainly appreciate the tone that is quickly established. It helps to expedite the intro and setup. Newsarama recently interviewed Len Wein, providing insight on his plans and direction for series six. 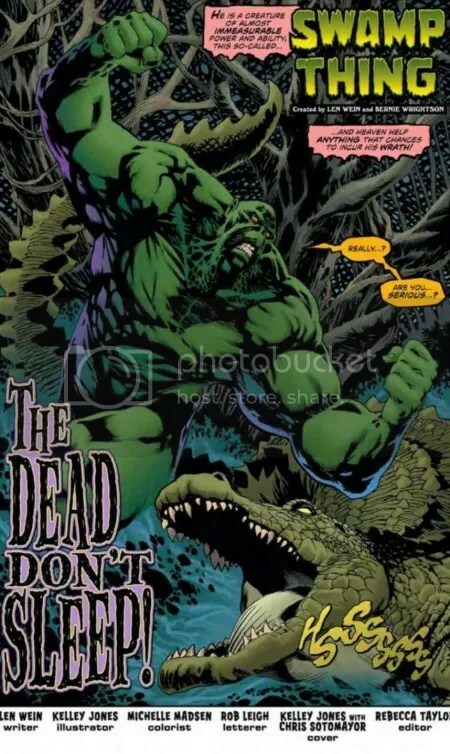 After the new 52 reimagining, I am very relieved that Wein is taking Swampy back to his horror roots and leaving behind that which the new 52 introduced. Some of his quotes in the interview have me very excited! I thoroughly recommend reading the entire article. 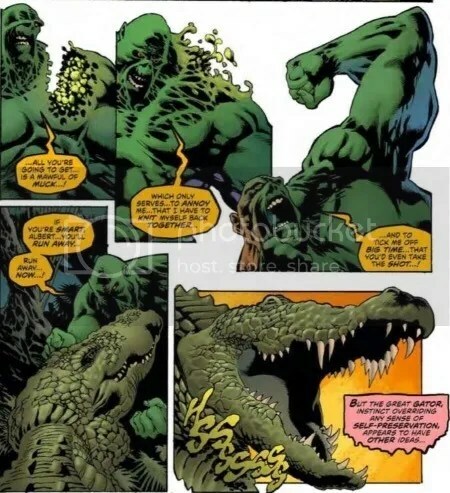 Swampy’s origin story is tightly conveyed in a single page and moves right into the first half of the book… a skirmish with an alligator, fondly referred to as Albert or Albert. Wein’s narration, seemingly poetic pairs really well with Kelly’s visuals. It is clear that the two artists are having fun with this book and will carry over into the remaining 5. 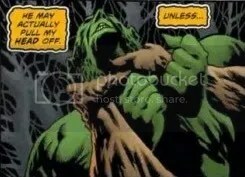 Right out the gate, Swamp Thing displays a strong knowledge of manipulating and convening with his surroundings. Again, setting a good pace in regard to ST’s setup. in regard to continuity, Len mentions, “I’m sort of, I guess, going back to “square 2,” not square 1″. 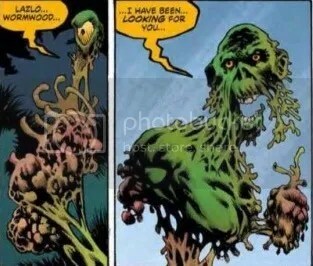 Above, Swamp Thing mentions the Parliament, referencing an established relationship; one that is tiring and seemingly a strain on his day-to-day. I love the above panel of Swampy looking vulnerable and cautious. 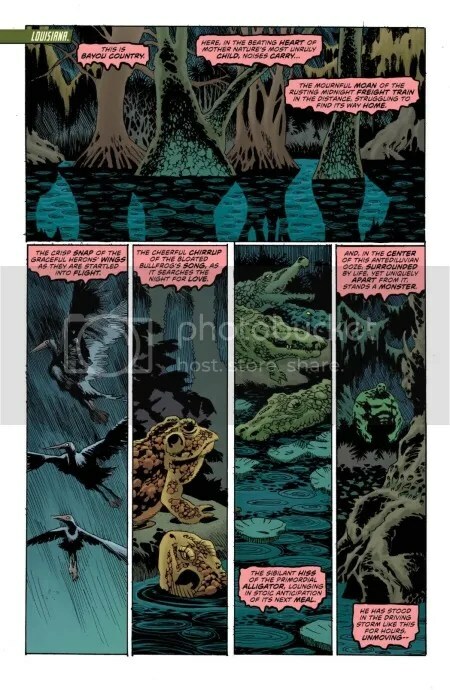 “you always have known… how to make an entrance…” It’s nice to see that Swampy and Phantom Stranger have a history already. No time is wasted with backstory or introductions. 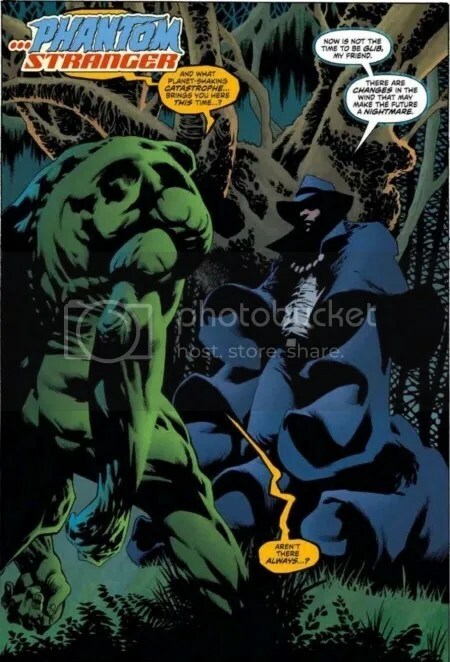 Kelley Jones’ Phantom Stranger is phenomenal. The billowing cape is so cool. Swampy mentions the Parliament has grown paranoid while Phantom Stranger warns of changing “wind that may make the future a nightmare”. Swamp Thing may be relieved to cutback on communicating with the Parliament but trouble is certainly brewing and around the corner. The first half of the book is pretty great and the finish is just as fun. I hope you enjoy this issue as much as I did. There are a number of allusions and foreshadowing that has my interest piqued. I’m excited to hear how it is recieved and to discuss it with other fans. Below are a series of images that I enjoyed from the second half of the book. I included images that won’t spoil the story, if you haven’t read it already. This first issue has it all! 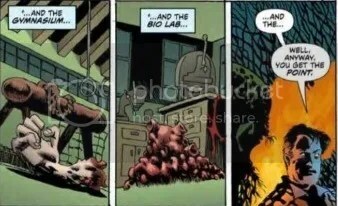 The book provides plenty of nods to Swamp Thing series 1. 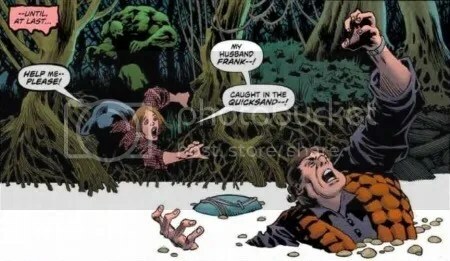 The above splash page looks like an homage to Wrightson’s style of monster. Wein mentions “a lot of surprises” numerous times in his Newsarama interview. 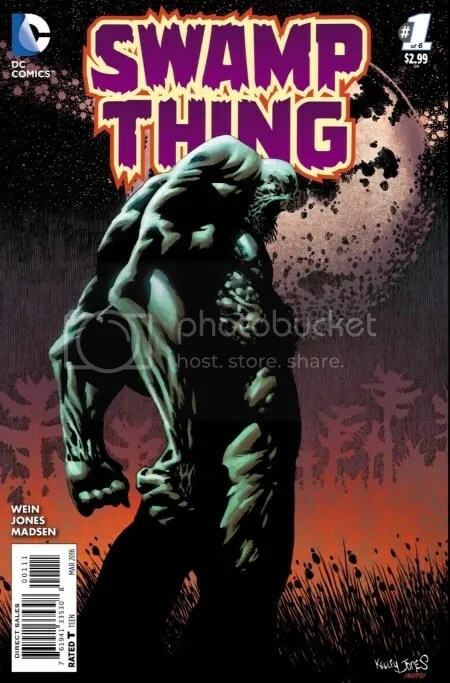 I’m excited to see what he and Kelley Jones come up with and how the two greats put Swamp Thing back on track, placing our favorite muck-encrusted monster back in the world I love. all I really want to know is what happens after these six issues. Wein seems to be saying that he has plans for after but the interviewer doesn’t follow up on it. god I hope it sells well! I see you cleaned up the appearance list and got rid of those nasty reprints. it looks great. might have to change the name to “reading order” or something now. Yah! I’m still trying to iron things out. I sure hope it does well in sales too. Thanks Mark! That was a nice write up on an excellent first issue! The image of Lazlo in the moonlight still gives me goosebumps. Nice write up John, good work. I also agree with David on the shot of Lazlo. 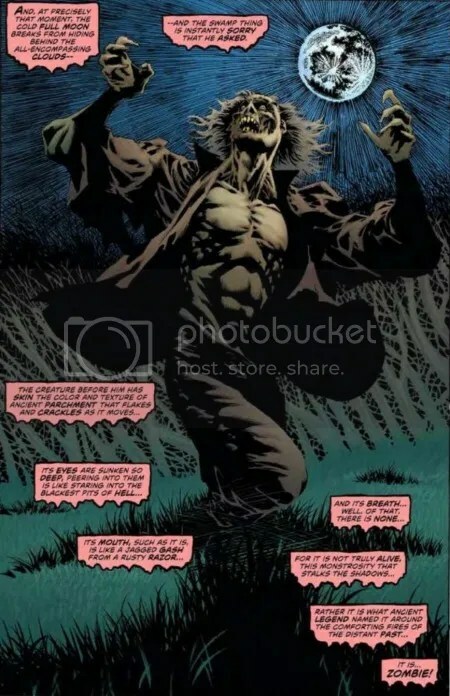 Hopefully in time we can get a print of that shot, or Phantom Stranger for that matter.